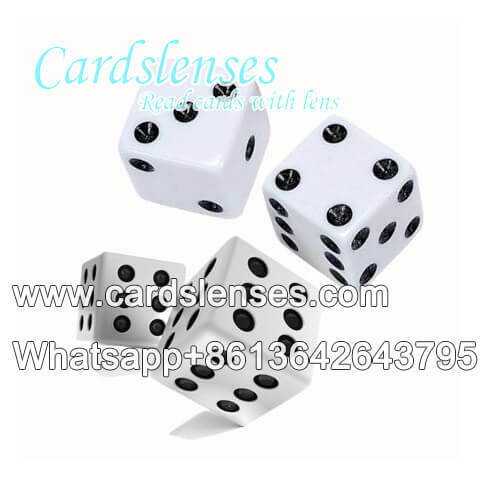 A set of induction dice are including radio dice, radio transmitter, battery and sensor. Our experts bury a radio transmitter and a battery inside a dice. Once the induction dice stop after you throwing it, the radio transmitter will send the signal to the sensor and you can know the pips by the shaking ways of the sensor. For example, if you ask to 1 pip corresponds to one long shake and 2 pips corresponds to one long shake and one short shake, then when you get 2 pips, the sensor will shake two times with one time long and one time short. And that means you can know what pips you get in advance. The battery of the receiver is replaceable while the battery of the induction dice is not. And one sensor can receive the signal from one induction dice.